C. Thomas Howell wears black low cut Converse “Chuck Taylor” All Stars in the film. Sgt. Major Carey and Sheriff Buelton go to war in the film Tank. Tank stars James Garner as Zack Carey, an Army Sergeant Major who has been transferred to a base next to a small Georgia town to finish out the last two years of his military career. One of Zack’s hobbies has been to purchase and restore to operating condition a vintage World War II Sherman tank, which he brings along with his family to the Army base. One night, he ends up getting into a fight in a bar with a local deputy sheriff (James Cromwell). The fight began after the deputy slapped a young girl, Sarah (Jenilee Harrison), who actually is a prostitute, that Zack had been innocently talking to. 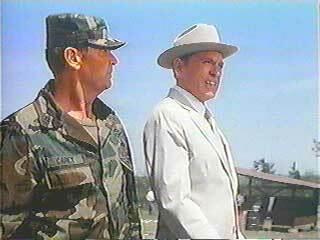 This leads to a run-in with the local sheriff (G. D. Spradlin) who cannot handle anyone from the outside interfering with his dictatorial control over the town. He comes storming onto the base demanding the arrest and release to him of Sgt. Carey. The base’s provost marshal, Sgt. Tippet (Dorian Harewood), had been tipped off about the situation, and hated the sheriff anyway because of his arrogant and racist behavior, so he tells the sheriff that he will be glad to turn the sergeant over, but it will mean declaring the entire town off-limits to all base personnel, to prevent any further incidents. Of course this would ruin the town financially, because the local businesses are very much dependent on soldiers spending their money in the town. 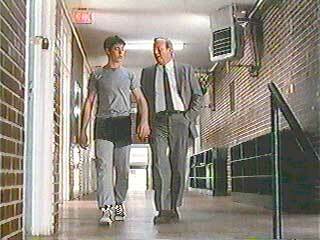 The school principal brings Billy to his locker for a drug search. Defeated in this encounter, the sheriff tries another tactic. He has drugs planted in the school locker of Zack’s son Billy (C. Thomas Howell) and jails him on drug charges. Although Zack tries to cool the whole incident down by volunteering to pay off the sheriff, the sheriff wants to teach Zack a lesson in power. So he takes him for a tour of the labor camp he runs, and has a prisoner beaten to show what will happen to Billy if the case goes to court (the sheriff’s brother-in-law is the judge). Zack agrees to a payoff and to not hire a lawyer, but when Zack’s wife LaDonna (Shirley Jones) hears of what has happened to Billy, she is furious and contacts a lawyer anyway. Meanwhile, Zack has gathered up the bribe money to pay off the sheriff, but when he goes to the police station, he finds out that the trial has already occurred, and that Billy has been sentenced to three years hard labor. To add insult to injury, the sheriff also keeps the briefcase of money, saying that this is enough to protect Billy from harms way for the first year of his sentence. Frustrated by the turn of events, hatred for the crooked sheriff, and concern for the safety of his son Billy, Zack reacts in the only way he knows how. He drives the tank off the army base and declares war on the sheriff. His goal: rescue his son and drive to the Tennessee border where he thinks he can get a fair hearing. The rest of the film is about how these events unfold. Billy is chucked in jail on trumped up drug charges. Normally when you see a James Garner performance, you think of the excellent Rockford Files series, where you see well written scripts, and a cast of characters often scurrilous, but very believable and entertaining. Unfortunately, the characters in this story are so stereotyped, it is hard to believe any of them could be real. For example, the sheriff is portrayed as being so evil that even his own mother would have to hate him. Within about twenty minutes of film, we see him call the black provost marshal “boy”, whip Sarah for not kowtowing to his authority enough, have a black prisoner at the labor camp beaten to show Zack what power he has locally, warn Zack not to bring in any “Jew lawyers”, and rail on about communists and pinkos. The storyline also suffers from a lack of logic. Anything that might interfere with the ultimate battle between good and evil is conveniently thrown away. Just for starters: Why is a uniformed deputy sheriff playing pool in a bar while on duty? How can a kid who has been only attending the local school for a few days be arrested as known drug dealer? If LaDonna Carey did retain a lawyer, why was the trial over so quickly? Even the most inexperienced public defender could get a continuance to prepare the case and file motions on a felony charge. For that matter, why was a juvenile being tried in adult court? And why could the media track this tank down wandering through the Georgia countryside, but the authorities had no luck? There was an opportunity for some interesting character development within the Carey family in this film, and a little of it was expressed at the beginning in a scene with Billy and Zack, when you see Billy talking about his older brother, who was killed in an accident, and how he felt was never loved as much. LaDonna Carey could have had a greater role in this story too, but most of the time she is portrayed as a one-dimensional “stand by your man” type. But if you want your good guy vs. bad guy buttons pushed, and you can leave logic at the door, this film will give you some entertaining moments. Billy contemplating the strange turn of events in his life. 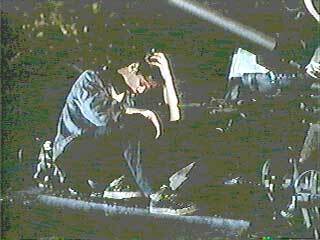 There are not a lot of good chucks shots in this film, but you do see C. Thomas Howell wearing black low cuts in most of his scenes. The best sequence of shots is when one of the tank tracks breaks down, and Billy has to take over from his dad. Billy and Sarah help the injured Zack. Tank. (1984) James Garner, C.Thomas Howell, G. D. Spradin, Shirley Jones, Jenilee Harrison. Directed by Marvin Chomsky. Category: Drama.